On Monday, the Department of Justice announced a new national website for hate crimes reporting. Deputy Attorney General Rod Rosenstein noted in his remarks that "the tragic attack on the Pittsburgh Tree of Life Synagogue just two days ago serves as a stark reminder of the need to protect all Americans against hate crimes." Rosenstein called the new site a "one-stop portal" with "information for law enforcement, prosecutors and the general public to learn about all the resources available to report hate crimes." The site is part of an ongoing effort within the Department of Justice to expand protections against hate crimes and to bridge gaps in hate crime reporting. The gaps are well-documented: In 2016, Politico reports that "88 percent of agencies that report hate crimes to the FBI reported zero hate crimes." Rosenstein told the group of law enforcement officials in Washington, D.C. that "that statistic demonstrates a lack of awareness in how to report hate crimes rather than a lack of them." Visit the DOJ Hate Crimes website for facts and statistics, prevention resources, and tips on the proper way to report a hate crime. 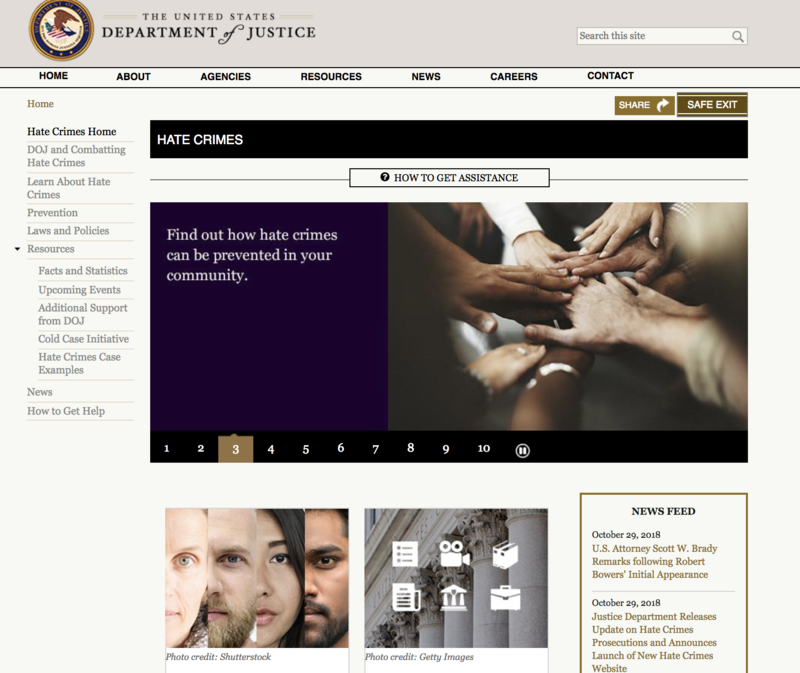 DOJ Hate Crimes website homepage.